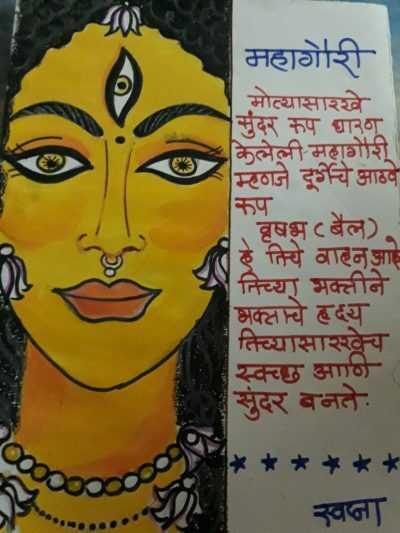 In the past couple of years I have been dedicating a post on my blog to Maa (Mother), Goddess Durga. This year too let me touch another aspect of my life that revolves around Her. Navratri is the festival dedicated to the worship of Maa Shakti, Maa Durga, Maa Parvati as she is lovingly called by her beloved devotees. 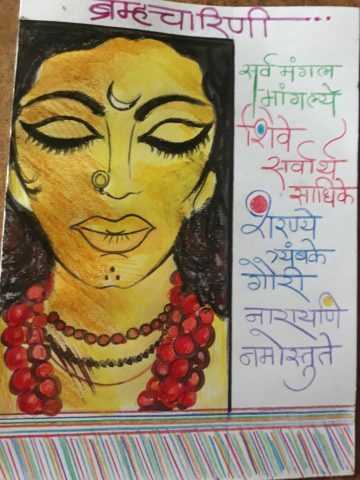 The word Navratri means 9 nights in Sanskrit. During these nine nights and ten days, nine forms of Maa Durga , are worshiped. It is believed that Maa Durga visits earth during these pious days. The 10th day is celebrated as Vijayadashmi or Dussehra. The festival is celebrated all over the country in many different ways. In the Northern part of India, these days are celebrated by way of fasting for 9 days and worshiping the different forms of Maa Gurga. In Gujarat and Maharashtra it is celebrated by having the Garba and dandiya for the 9 nights. In Eastern part of India especially among the Bengali community, It is celebrated as the Durga Puja. The festivities are for 5 days and they are community celebrations. The idols are huge and exquisitely crafted. They adorn the huge pandals (Shamiana) where they are worshipped and then the idol is immersed in water on the 5th day. In the Southern part of India it’s celebrated as Bomma Kolu (Golu) in Tamil, Bommala Koluvu in Telugu, Bombe Habba in Kannada. They do a doll and figurine display in their homes, it is customary in the states of Tamil Nadu, Karnataka and Andhra Pradesh . I look forward to the celebration of Navratri each year like a lot of other women. 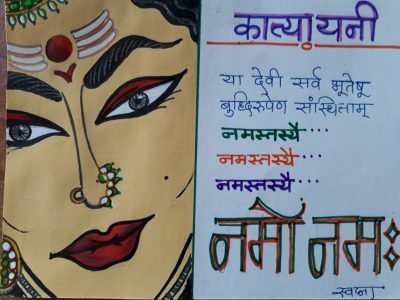 Mumbai women have over the years developed their own unique way of celebrating this festival. They follow a kind of a colour code for these nine days. Each day there is a different colour, the list is published in the Maharashtra Times. Among the career women, who rush to their work places by the local trains hardly dress up in their traditional finery otherwise. But Navratri sees them dressing up in their traditional best and all following the colours of the day. Just the other day, I received a Whatsapp message titled ‘Colours of Navratri’ sent by a colleague to all the ladies working in my office. Following this list we’ll be wearing our traditional sarees or salwar kameezs in those colours. Every office here in Mumbai has a similar story, all women whether married or not will be trying their best to adorn the colour of the day. Some may even buy outfits that they don’t have in their wardrobes. Come Navratri, the moment we step out of our homes we find the women wearing similar hues. On reaching the local train station it’s a beautiful sight to see the women dressed up for the occassion. Some of them don’t even wear footwear for the entire period of the Navratri. Evenings are generally the time to visit the local dandiya ground. Where, dandiya begins in the evening around 7.30 pm with Arti of the Devi and then playing the favourite music, an old classic or just the flavor of the season. Children look forward to the dandiya nights celebrated in their housing societies. They are among the first dancers on the floor. Mumbai is different during the Navratri; dandiya fever is in it’s peak. In fact one gets to hear the music much before the first Navratra, as the bands comprising of college students and working people, practise each evening preparing for the festival. For them it is also a way of enjoying the festivities as well as making some good bucks! At the Dandiya venues the people generally wear the Gujarati style chaniya cholies and men wearing the traditional outfits. It’s fun to see how couples come colour co-ordinated. The jewellery is generally the oxidized one. The young girls pick their jewellery as well as the outfits for the 9 days from Gujarat, or in Mumbai, places like Bhuleshwar Market. So Navratri is round the corner and I am looking forward to welcome the Divine Mother in my home. We begin the festival with keeping the kalash and sowing barley in an earthen pot (which will grow till the tenth day and this will be used for the Dussehra puja at home). The Mandir (temple) at home will be decorated with the best of flowers; will light the akhand jyot (the oil lamp) which will be glowing for the next 10 days. Will have a kirtan at home in the afternoon, where we invite ladies and they sing the bhajans of Maa Durga and other deities. This will be followed by the Arti and distribution of prashad to all the ladies. Most of the women fast during this period so prashad generally consists of fruits, dry fruits and milk. 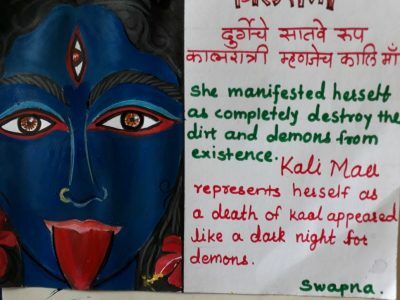 The women also get the ‘Suhagi’ (bindi, sindoor, mehendi, nail polish, glass bangles tied together with a red ribbon) and anything else the lady of the house wants to give to the women attending the puja. To me there have been many women who have touched my life and have brought so much happiness and blessings. My mother, who has given me a mind and the power to think that nothing is impossible. She has ensured that my sister and I have got equal opportunities, good education and the confidence to face the world, no matter what the situation. I have had friends who have always been there, they have given me so much of love, confidence and belief in myself to dare to dream and work towards fulfilling those dreams. My mother in law has been the pillar of my strength. A lady who has given me a clean canvass that I could paint the way I wanted. I can see the picture shaping up better with each passing year. She has taken over from my mother and has given me all that once my mother did. I can always count my blessings; whatever little I have been able to achieve over the years I owe a large part of it to my mothers – mom and mom in law- who has been my Shakti. A lady who believes in me more than I could ever do. I also take this time to cherish all these beautiful women in my life. I am because they are! Above all we must all try to make the environment both at home or outside safe for every woman – that’ll be truly our offering to the Goddess. I am sure She’ll be more than pleased! This year Navratri will be celebrated all over the country from 10 to 18th October 2018. It’s the time for fasting and feasting and pleasing Goddess Durga and seeking her blessings! 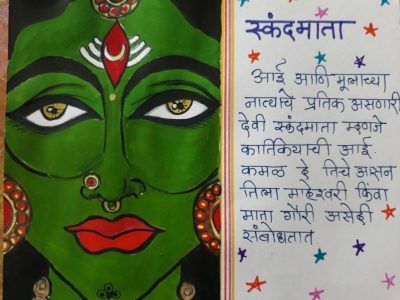 This time celebrate Navratri, the Bambaiya style (as it is celebrated in Mumbai). Be seen in the colour of the day and go play dandiya. Soak in the festivities, meet up with friends and family and enjoy to the fullest; while invoking the manifestations of Maa Shakti. In Mumbai it’s more of a festival of bonding over great festivity with dandiya than it being a religious one. It is spiritual and carries the essence of the spirit of the city – you could be following any religious beliefs but all unite for the dandiya nights across the city. 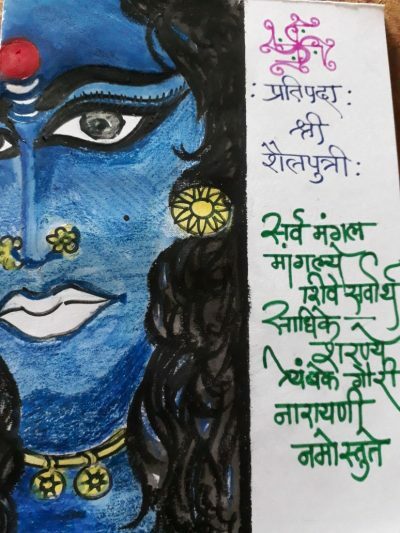 Picture Courtesy: Ms. Swapna Deshpande, can’t thank her enough for sharing these mesmerising manifestations of Maa Durga.